The most anticipated match of the Premier League season so far. Liverpool and Manchester City clashed in some memorable games last season and both sides look likely to challenge for the title this year. 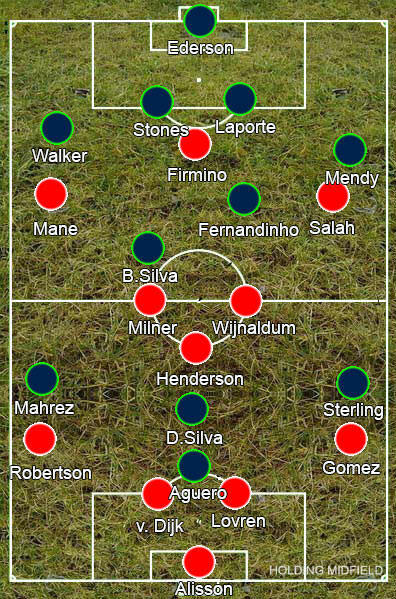 Jurgen Klopp set up his team in their usual 4-3-3 formation, while Pep Guardiola opted for a rare 4-2-3-1, with Bernardo Silva positioned deeper than usual in midfield and David Silva roaming ahead of him as more conventional number ten. Liverpool started the game at a high tempo, pressing with intensity high up the pitch to win the ball back and strike immediately at City’s defence. This tempo was unsustainable though, especially having endured a game in mid-week against Napoli. After ten minutes or so, the match settled into the pattern that remained for the majority of the match. City struggled in part in those opening stages because Bernardo Silva wasn’t always sat next to Fernandinho in the build-up, making it harder for City to play out, but once he dropped back permanently and Liverpool eased off, City looked much calmer on the ball. City’s gameplan appeared to be to bait Liverpool into pressing. In the first stage of the build-up City would form a back three, with Kyle Walker tucking in alongside the centre-backs, while Bernardo Silva and Fernandinho would sit ahead of them in the spaces between Liverpool’s front three, and Benjamin Mendy would be in roughly the same line off to the left. 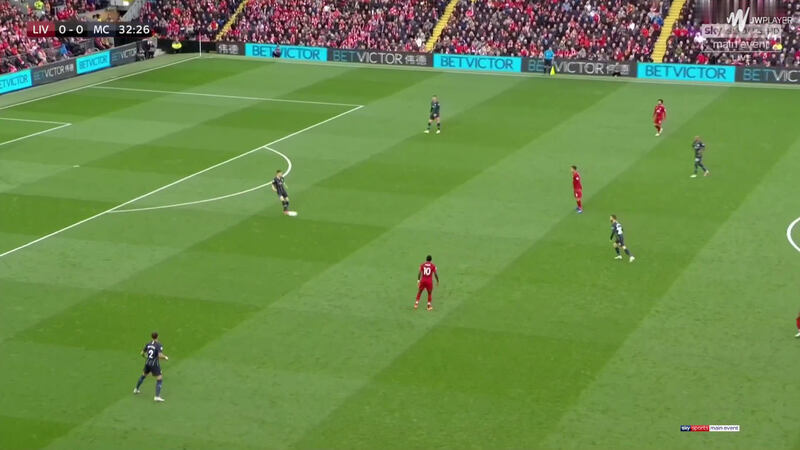 If Liverpool’s forwards pressed, the centre-backs would then quickly drop off and Walker would run out to hug the touchline like Mendy and the two midfielders looked to receive the ball on the edge of the area. 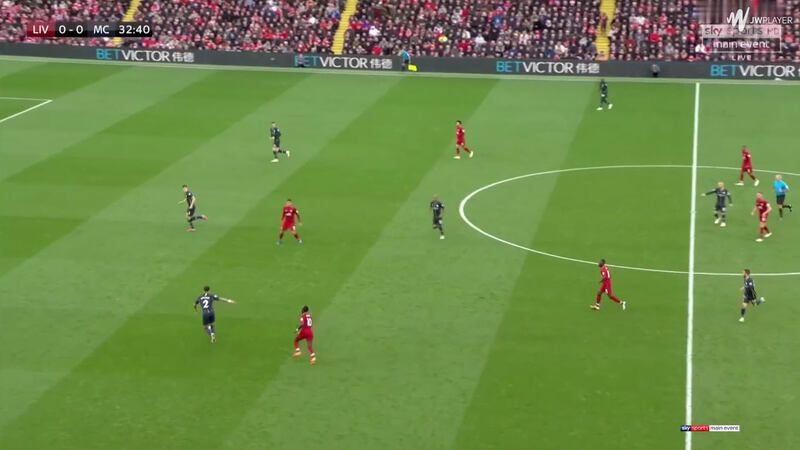 This posed a problem for Liverpool as it left five players trying to defend against seven. If the attackers didn’t press the centre-backs or Ederson, then they could easily play out, but if they did that James Milner and Wijnaldum would have to push up to stop Bernardo Silva and Fernandinho receiving the ball, which in turn left Walker and Mendy free to break forward on the wings. Liverpool’s answer was simply to not give in to the bait. They would press occasionally to keep City’s defenders on their toes but for the most part they simply sat off, kept tight in the centre and asked City to play through them, which City couldn’t do. City would pass out to Mendy in space on the left, but, not match sharp, he rarely threatened. 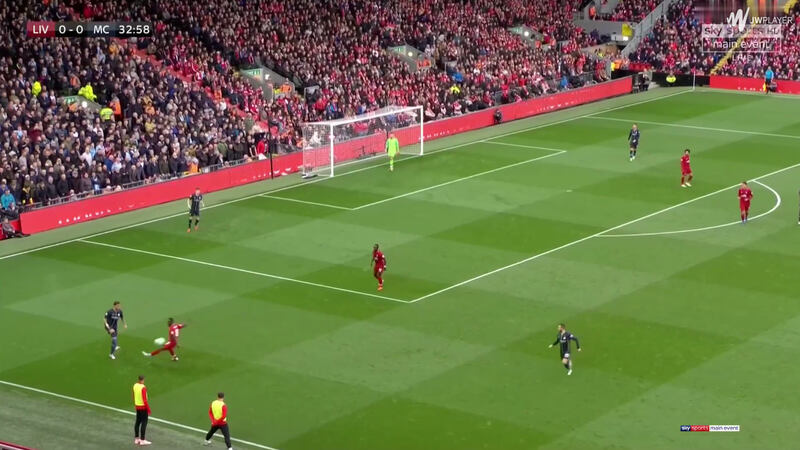 David Silva’s excellent movement out towards the left caused some problems, with Jordan Henderson finding it difficult to decide whether to follow him and leave space in the centre or let him go and have him pick up the ball, but that was Liverpool’s only real headache. City’s build-up meant six of their players were positioned deep and as a result Liverpool’s defence always had cover against City’s attack. Liverpool’s build-up was pretty much the same idea, albeit simpler. They would pass around the back to draw City into pressing and then look to hit a long ball over the top for their pacey attackers. 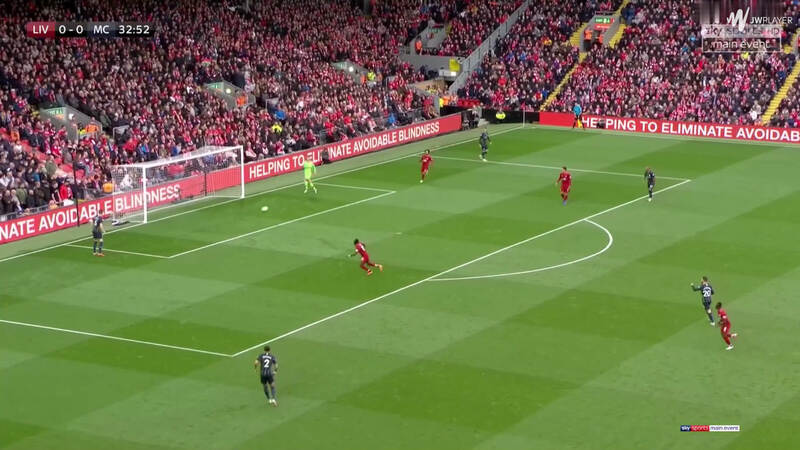 City didn’t give in to the bait either though and so Liverpool rarely had space to hit those long balls into – City’s defenders finding them easy to cut out. Milner would pull wide and deep to the left, making it easier for him to get on the ball. His long passes were more accurate than the defenders’ but with City dropping off, the attackers rarely had the space to attack, and he had to go off injured in the first half. With neither team willing to push forward, the match reached an impasse. Liverpool started the second half quite well, copying from City’s playbook by having Milner’s replacement Naby Keita drop in alongside Henderson to help play out from the back. David Silva had stuck close to Henderson, making it hard for the defenders to play out, but adding Keita left him outnumbered and City were forced deeper into their half. Liverpool didn’t try to work their way through the middle though, instead trying to send in crosses from out wide – most of these came from Joe Gomez and, as a natural centre-back, they were rarely accurate. City were better suited to breaking down a packed defence and were unfortunate that Riyad Mahrez missed his late penalty but neither team were ambitious in this game. Both managers made only two changes, both like-for-like, and could be content with a draw. Guardiola was likely happy to escape Anfield without another loss and Klopp was probably happy that his team had navigated a tricky run of fixtures and come out the other side joint-top of the league.